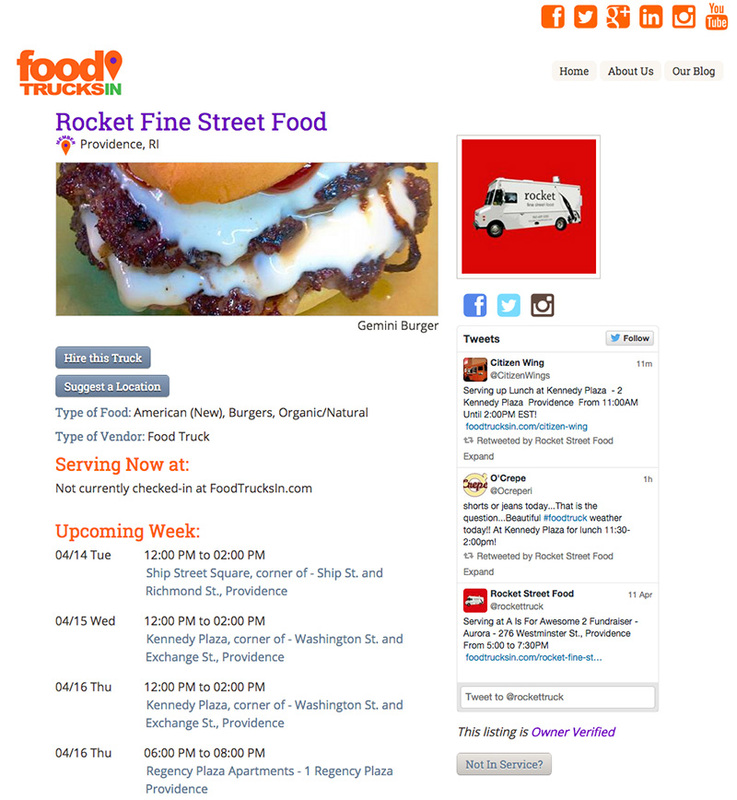 FoodTrucksIn.com is building a list of every mobile food truck, trailer, cart and stand across the country. Currently, we include mobile food vendors in over 1,100 cities. 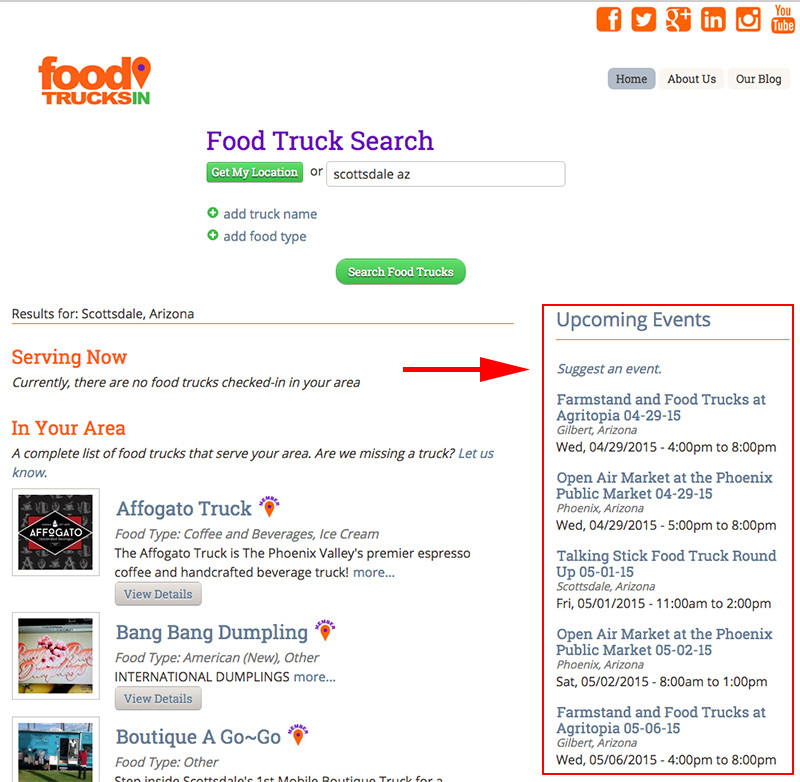 All mobile food vendors have a free listing on FoodTrucksIn.com. Use the chart below to compare benefit levels between Members and ProMembers. Become a ProMember and take advantage of all of the available features. 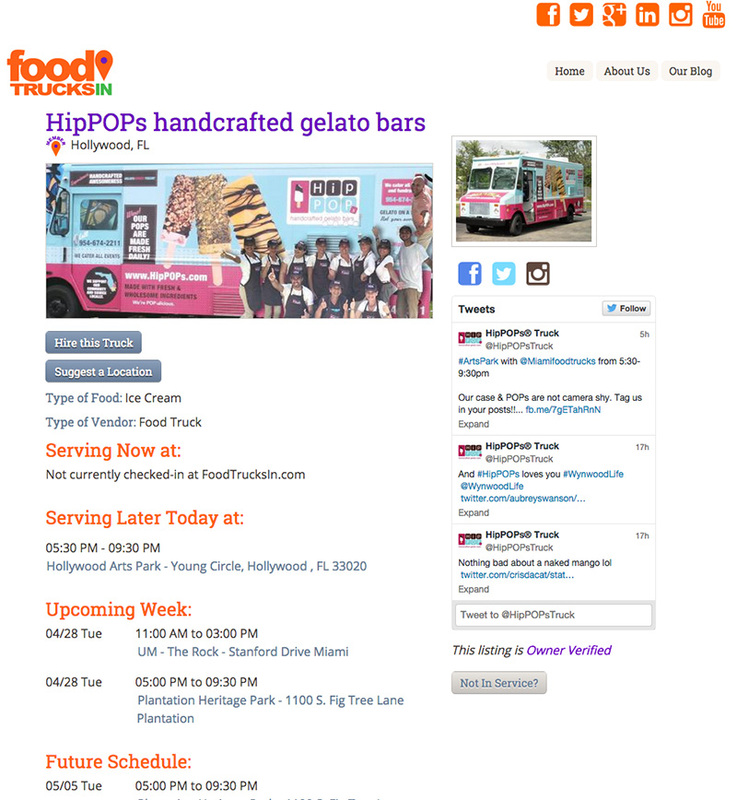 Each vendor receives a free Profile Page on FoodTrucksIn.com which, as a unique URL, can be used as a web address for mobile food vendors that have not set up a website. 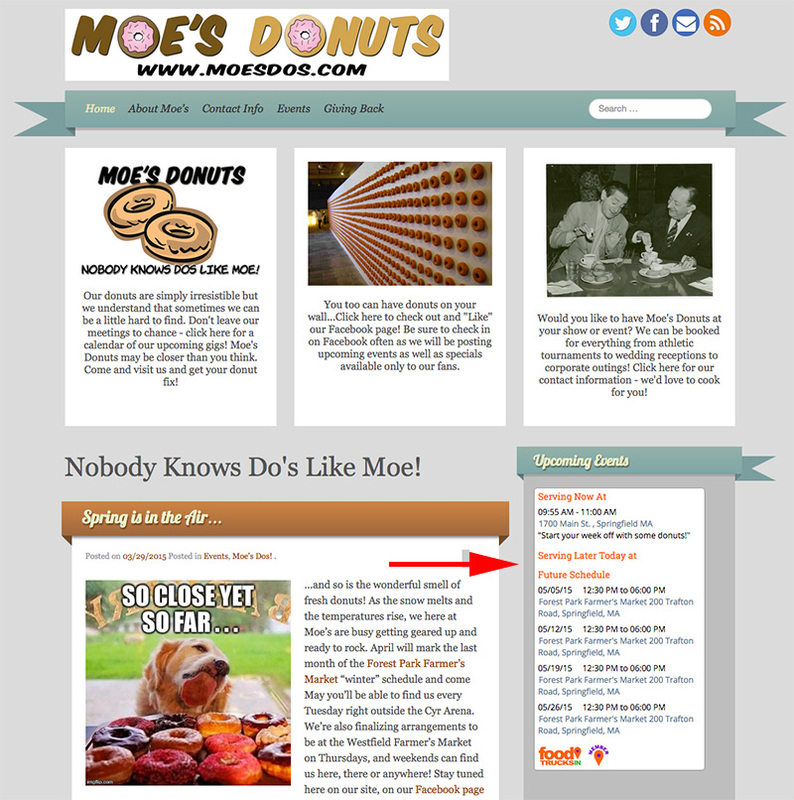 Each vendor's public Profile Page is visible in Search Results and on City and Event Pages. Vendors can subscribe to become Members or ProMembers. Members may update their Profile Page and have access to many features and tools designed to help grow your business. ProMembers receive additional enhancements including the ability to post upcoming schedules and menus as well as public access to contact info on their Profile Page which includes email addresses and phone numbers. (click on the images below to view examples of public profiles). 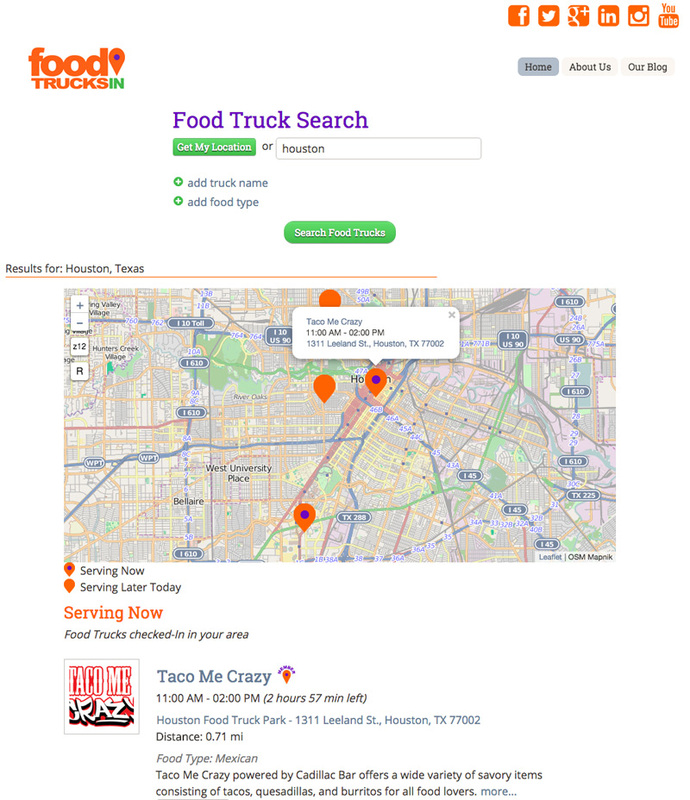 When visitors use FoodTrucksIn.com to search for mobile food vendors, results are returned in three categories: Serving Now, Serving Later, and In Your Area. Serving Now - Members and ProMembers who are currently serving by distance within the search location. Serving Later - Members and ProMembers who have scheduled service for later in the same day, by time within the search location. In Your Area - All food vendors who conduct business within the search location. Members and ProMembers that are Serving Now or Serving Later will appear pinned on a real-time Google map. 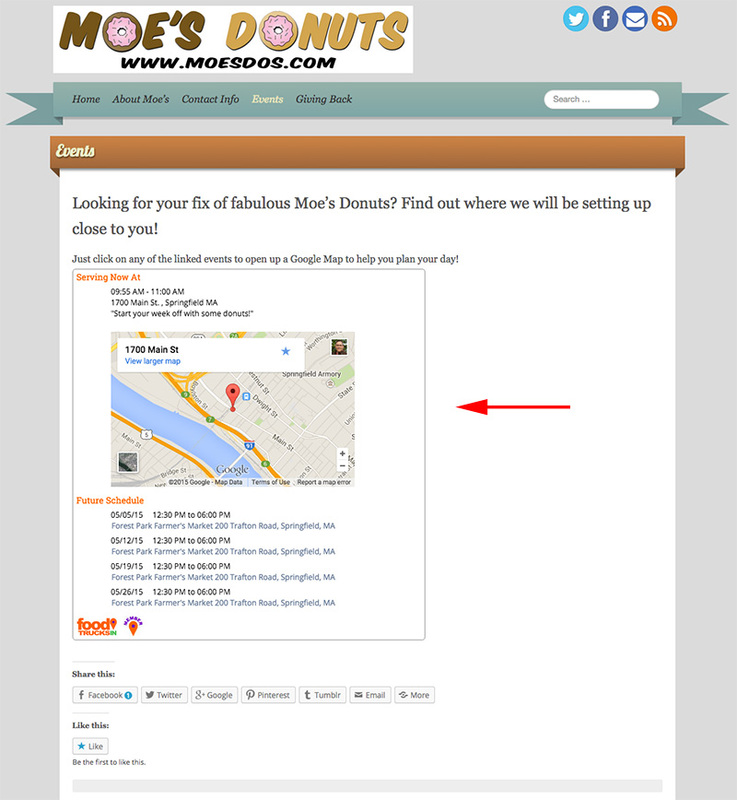 A key benefit of membership is the ability to post your serving locations and times. We call the the ability to communicate where and when you will be serving to your customers, "Checking In." When a member Checks In, their serving information is available in search results, on their public profile page, pushes to social media feeds, and on website widgets. Check in Now - Members and ProMembers have the ability to Check In Now, sharing their same-day serving locations and times. Future Schedule - ProMembers have the ability to set up future schedules for weeks (or even months) in advance. Post to Facebook and Twitter - Members and ProMembers can use the Social Media Integration tools to easily share Check In information on Facebook and Twitter. 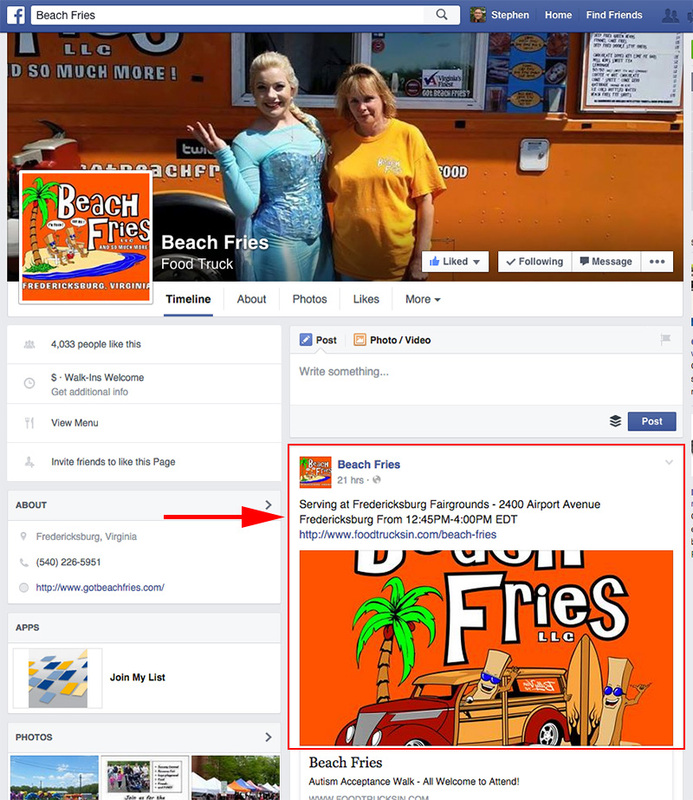 ProMembers have the added ability to schedule social media posts for specific times in advance. (click on the images below to view examples of schedule tools). 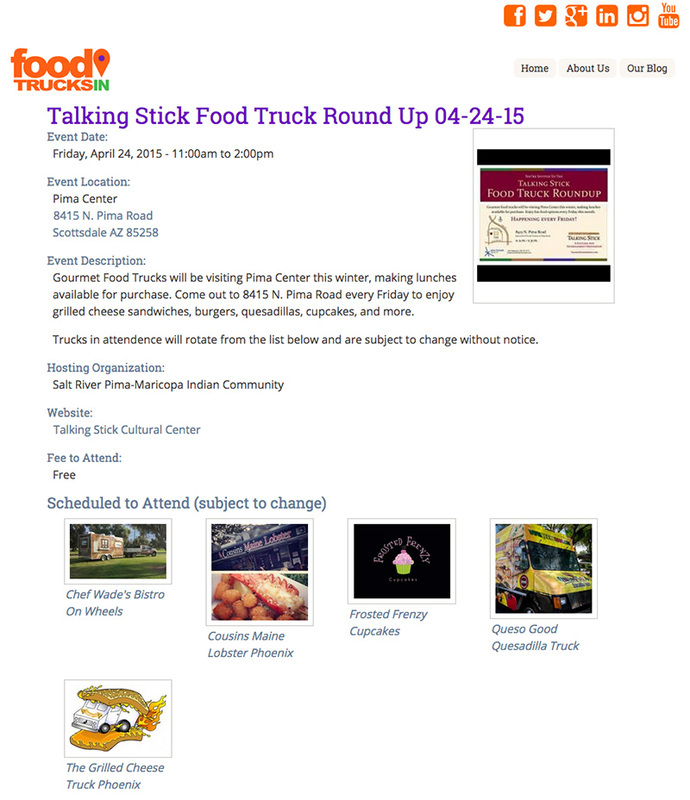 FoodTrucksIn.com widgets exist in multiple formats to integrate schedules and Check Ins with existing websites. ProMembership includes the ability to install the Website Widgets and the technical support to help with installation. Visitors to FoodTrucksIn.com are invited to use the Suggest A Location and Hire This Truck forms to share vending opportunities with mobile food vendors. Both forms can be used to share information with a vendor or with all of the vendors In the Area. 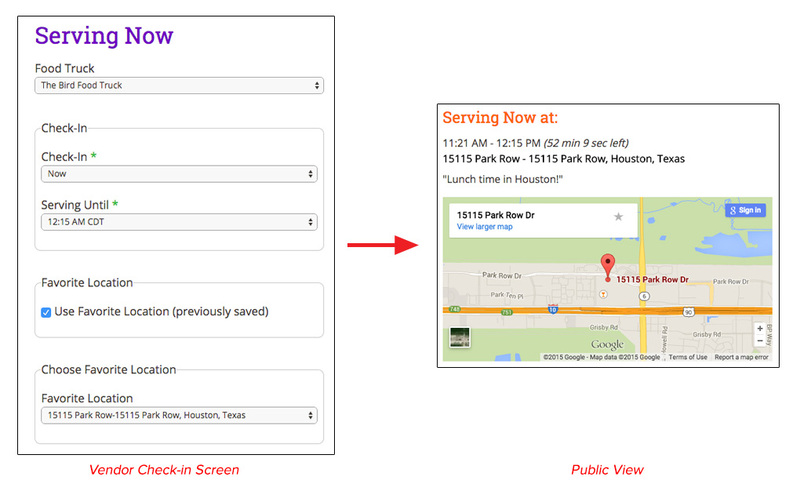 Suggest A Location - This form allows visitors to the site to recommend new serving locations to mobile food vendors. Members and ProMembers receive these recommendations as part of membership. 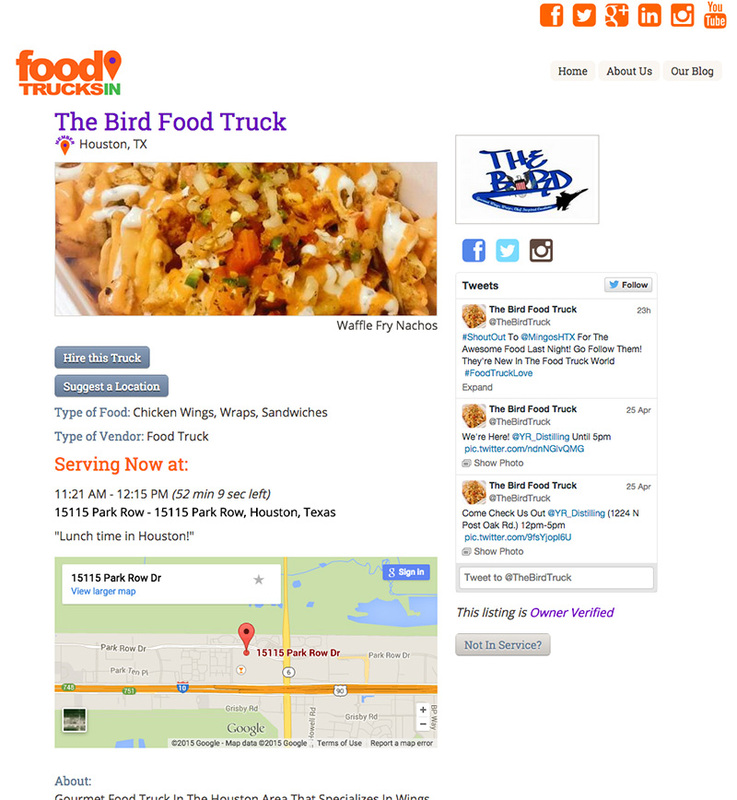 Hire This Truck - Visitors to FoodTrucksIn.com use this form to request a specific mobile food vendor for a funcation. This form is also used by visitors to ask a vendor to attend public events (where there may or may not be a fee to participate). ProMembers receive Hire This Truck requests as part of membership. Hire A Truck - Allows website visitors to reach out to a group of vendors when they are unsure of which specific ones they are looking to contact or if they need to reach multiple vendors for larger events. ProMembers receive Hire A Truck requests as part of membership. 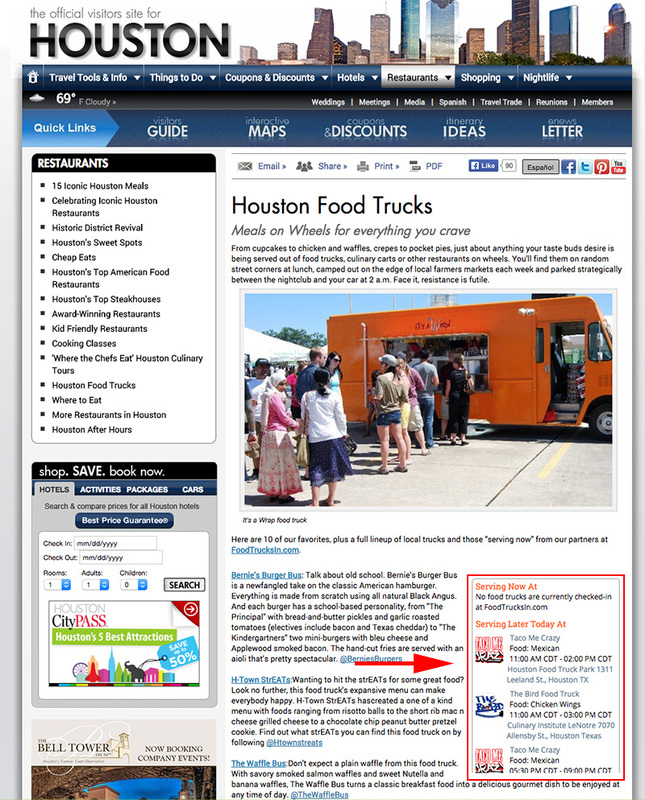 We recommend to all who fill out either Hire This Truck or Hire A Truck forms that they read our two most popular blog posts: How Many Food Trucks to Hire? - Useful Tips! and Food Truck Fee Structure. 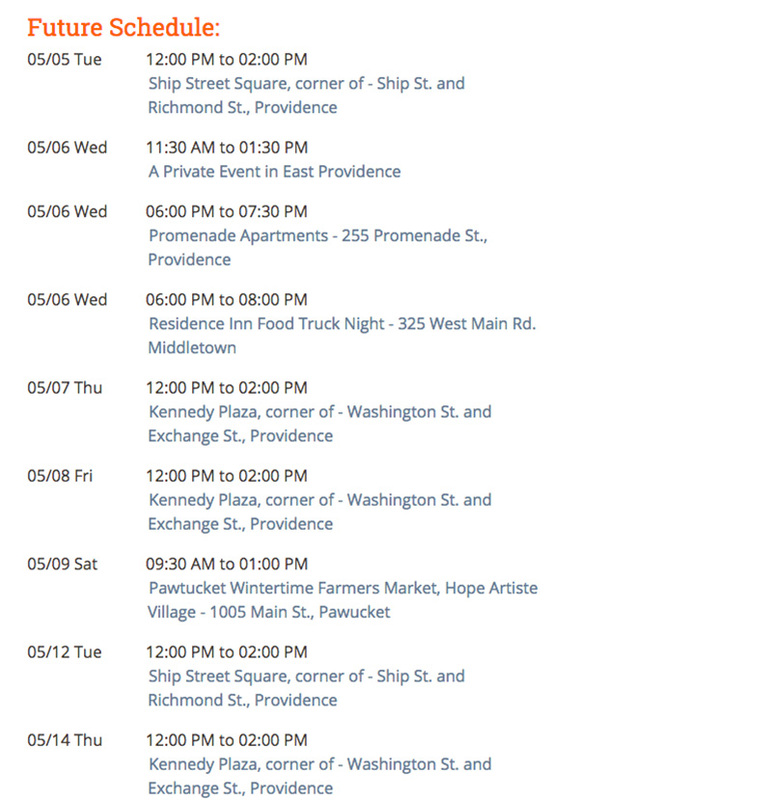 FoodTrucksIn.com lists food truck events as a free service. 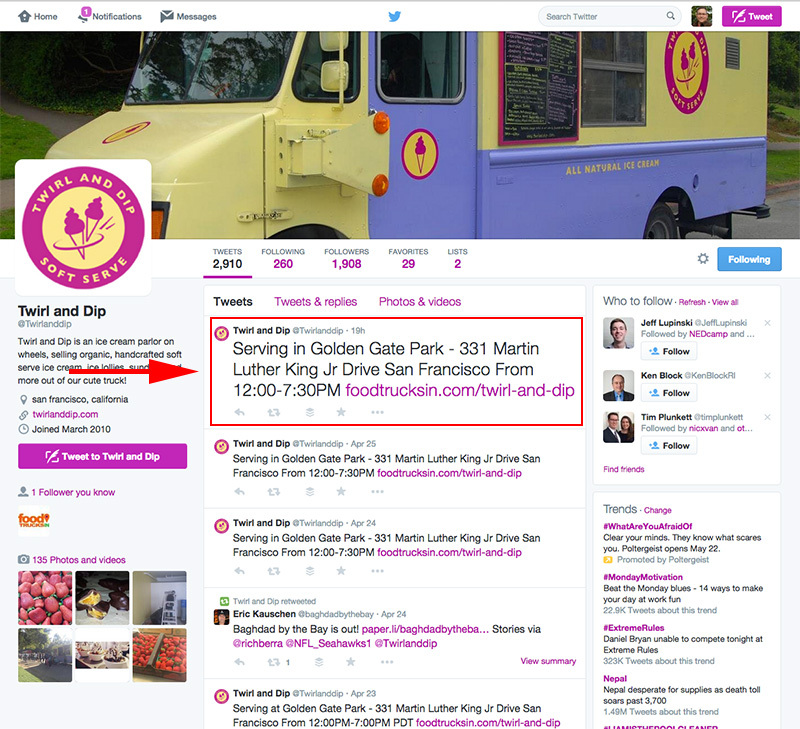 Any event with 3 or more mobile food vendors can be listed. Events are displayed by location as part of all search results and each has its own page with details of the date, time, location, and attending vendors listed. ProMembers are listed with a Member Icon. Be sure to let us know about YOUR events so we can include them as well!